Today is the 50th anniversary of the extra-judicial execution of our nation’s greatest prophet. 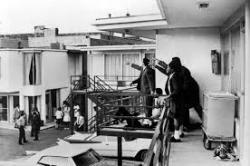 Dr. Martin Luther King, Jr. was gunned down on the balcony of the Lorraine Motel, in what was proven in a court of law in 1999 as a government “Black Ops” operation. The building was only saved by a concerted community struggle in the 1980s, and now houses the compelling National Civil Rights Museum. Under that infamous balcony stands a simple memorial plaque, inscribed with words from Gen 37:19f: “Let us kill this dreamer, and see what becomes of his dreams…” That question hangs over America like an unresolved chord. This afternoon, friends and colleagues will be gathered there to remember, and to continue the struggle “for the soul of America,” (being livestreamed right now). On this Easter Wednesday, Christians might well wonder what Jesus’ disciples would have been feeling after his execution by the imperial authorities. Luke 24 spins just such a story, and I’ve tried to weave it together with the context of Memphis after King’s murder in a reflection entitled “Easter Faith and Empire: Recovering the Prophetic Tradition on the Emmaus Road.” It was written in Memphis, and published in 2006 as a chapter in Getting on Message: Challenging the Christian Right from the Heart of the Gospel (Beacon). You can download that piece here. Or you can watch our 2013 webinar on the same subject here. May we learn the catechism of this history, until our heart burn within us enough to join the struggle for justice.